The frame "Mesh generator" serves to define the basic setting to generate mesh (left part) and to view information about generated mesh (right part). A successfully generated mesh completes the topology input stage - the analysis then proceeds with the calculation stages. When generating mesh the program automatically introduces standard boundary conditions. Information about the resulting mesh including warnings for possible weak points in the mesh is displayed in the right bottom window. The basic mesh density can be specified in the "Mesh generator" dialog window. I is generally accepted that the finer the mesh the better the results - computation as well as post-processing, however, may slow down substantially. The goal thus becomes to find an optimum mesh density - this mainly depends on the user experiences. Meshes generated in example problems may serve as an initial hint. The finite element mesh should be sufficiently fine in locations in which large stress gradients are expected (point supports, corners, openings, etc.). To that end, it is possible to specify the mesh refinement in the neighborhood of these locations. 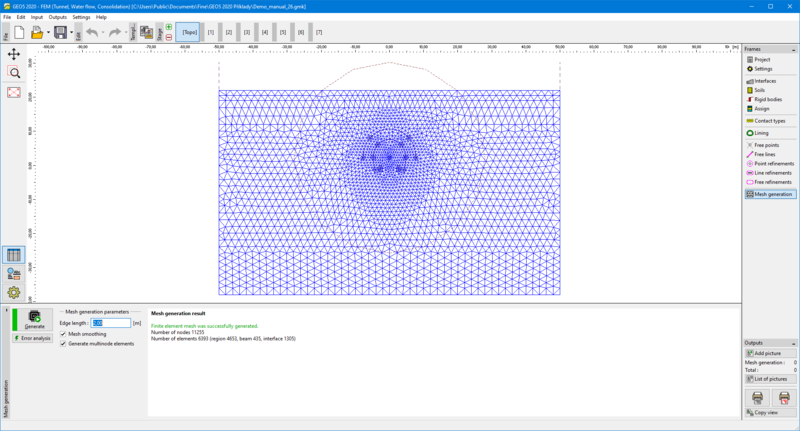 The mesh refinement can be specified around individual points or lines. The spread of refinement should be at least 3-5 times the desired refinement in the center of the refinement. Also, both values (density and spread of refinement) should be reasonable in view of the prescribed mesh density that applies to the surrounding region. This assures a smooth transition between regions with different mesh densities. Singular lines should be tackled in the same way. For more complicated problems it is useful to first carry out the analysis with a rather coarse mesh and then after examining the results to refine the mesh accordingly. 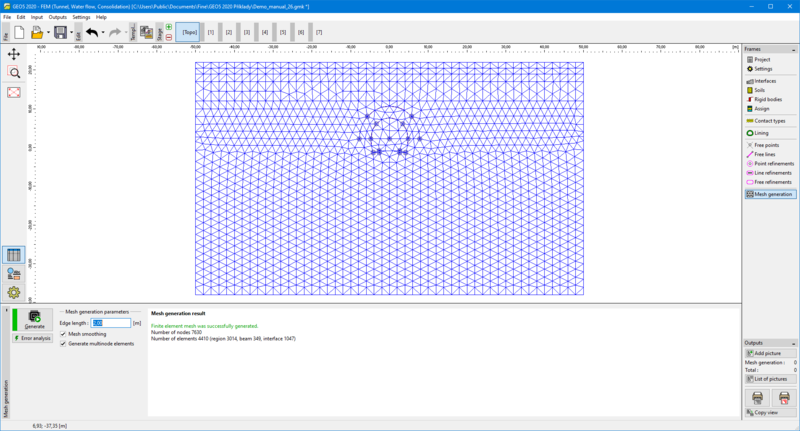 By default program assumes 6-node triangular elements with mesh smoothing. The accuracy of the results more or less corresponds to twice as fine mesh composed of 3-node triangular elements. The 3-node elements are available only in the "Advanced program options" mode (check box "6-node elements") and serve merely for research and testing purposes. The stability analysis, however, can be performed with 6-node triangular elements only. In case of nonlinear analysis, these elements should be used exclusively. 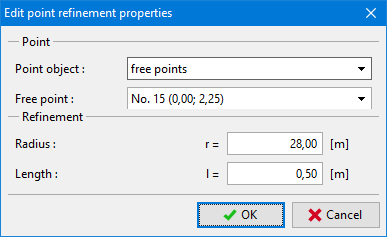 The "Advanced program options" mode allows also for the generation of mixed mesh (triangular and quadrilateral elements).